Not all of the women we read about during Women’s History Month (or any other month, for that matter) actually meant to make history. I’m sure some would be quite surprised to discover that a book or books have been written about them. Perhaps they lived in extraordinary times. Or they had to overcome an obstacle because they had no choice. And some of these fascinating ladies were even teenagers or children when life-changing events entered their lives. In learning about Matilda (Tillie) Pierce, I found all of these to be true. By the time Tillie was fifteen years old, she had lived a comfortable life in relatively unknown Gettysburg, Pennsylvania. Her father was one of the wealthier men in town, operating his own butcher shop attached to his house on Baltimore Street. Tillie was the youngest of four children and attended school at the Lutheran Ladies’ Seminary only a couple of blocks away. She had fine clothes, a good education, and a pleasant life. From all we know, she was a good daughter learning how to be a good housewife and mother, just like most of the young girls of this era. Eleanor Roosevelt once said, “A woman is like a teabag. 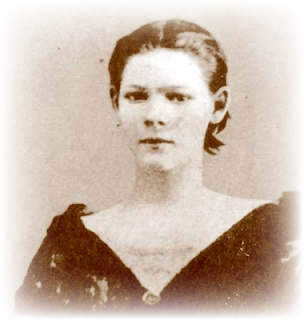 You can’t tell how strong she is until you put her in hot water.” In late June and early July 1863, Tillie Pierce and the other women, teenagers, and children of Gettysburg were steeped in the hot water of the Civil War. Gettysburg was just barely a northern town—only ten miles from the famous Mason-Dixon Line that separated the North from the South. Its citizens knew that a battle had been fought in nearby Fredericksburg, Virginia, only about 25 miles away. It was only a matter of time before the Confederate Army struck Pennsylvania. And strike they did—at Gettysburg. Rebel soldiers rode into the town and right down Baltimore Street on June 28, 1863. Everyone was terrified. Most of the Gettysburg men, including Tillie’s two older brothers, were away, fighting in the Union Army. Who would protect the town from destruction? Rumors stirred that Northern troops were on their way. Gettysburg was going to become a battleground, and, as it turned out, the bloodiest ever fought on American soil—and the turning point of the Civil War. As the battle began the morning of July 1, Tillie’s young next-door neighbor, Hettie Shriver, came frantically to the Pierce house. Her husband had left nearly a year earlier to join the Union Army, and she was alone with two small daughters, Sadie and Mollie, ages 5 and 8. She was determined to get them to safety by fleeing to her parents’ farm, three miles south of town. She asked if Tillie could come along—both for Tillie’s safety and to help with the children. A three-mile walk over muddy roads would not be easy. Hearing constant gunfire just north of the house, Tillie’s parents found this a good idea. Taking nothing with her, Tillie said goodbye to her parents and older sister, Margaret, and took off on foot with Mrs. Shriver and her girls. 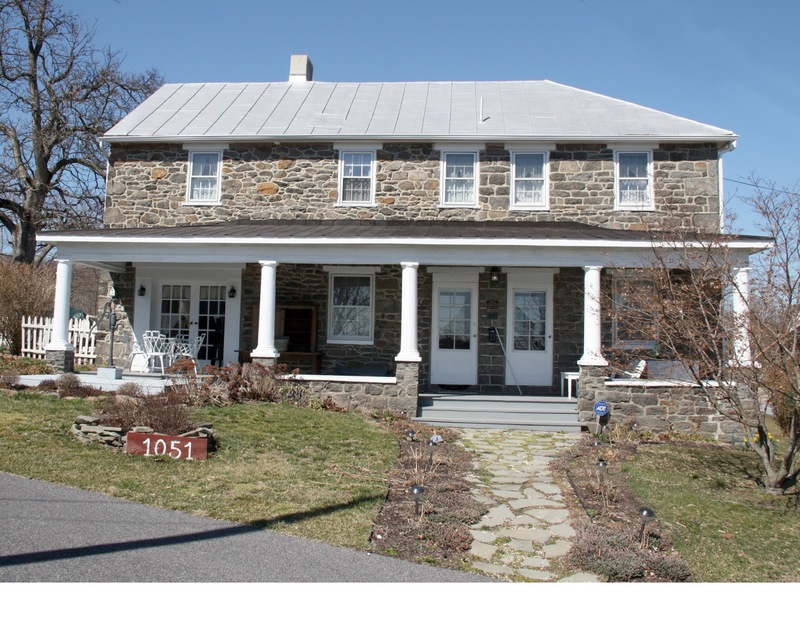 They headed south to Taneytown Road to the Jacob Weikert farm, just behind Little Roundtop. During the battle (which lasted three days, from July 1 through July 3), the women and children in Gettysburg stayed in their basements as cannons and rifles fired into, over, and outside the town. One young woman, Jennie Wade, was struck by a sniper’s bullet and died in her sister’s kitchen just a few blocks from Tillie’s house. She was the only civilian casualty of the battle. Down at the Weikert farm, Tillie was far from safe. The last two days of the battle focused on this area south of town—at the wheatfields, peach orchard, and Little Round Top. 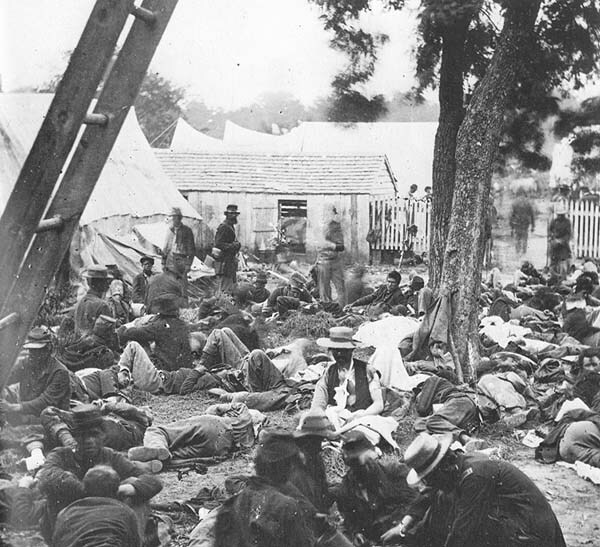 The Jacob Weikert farm became a field hospital—and very nearly a part of the fighting—for the seven days Tillie was stranded there. 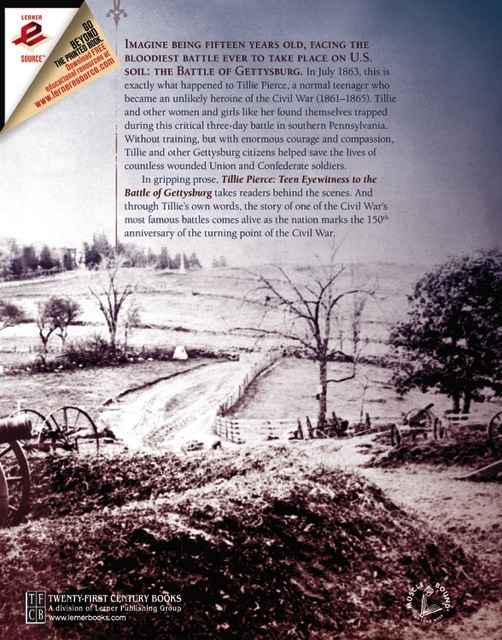 My book, TILLIE PIERCE: TEEN EYEWITNESS AT THE BATTLE OF GETTYSBURG, uses Tillie’s own words to describe her experience as she saw and heard the most horrifying aspects of the battle. 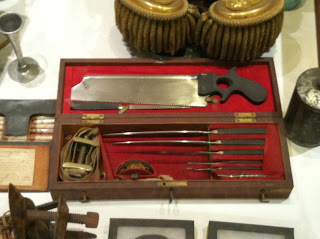 She gave water and bread to soldiers, talked with the dying men, offered aid to the surgeons and nurses. She was moved by the sight of piles of severed limbs, heard the wailing of the injured, and just kept doing what was necessary to help the wounded, both Southern and Northern men. And she worried about her family back on Baltimore Street. At one point, when she saw a huge fireball in the air over Gettysburg, she was hysterical until a soldier told her that the town was safe and what she had seen was a signal, not the town afire. Tillie reacted as any young girl would. She cried. She felt weak at times. She grew hysterical from fear about her family. But she found the strength to keep helping those whose lives were even more dismantled than her own. Tillie offered words of peace, promises to send word home, and gentle hands of comfort. Her heart was broken over all the destruction during the battle and afterwards when she walked back to her house, seeing the town’s cemetery in near ruins and houses pocked with shells and bullets. Over the next months, Tillie, her mother and sister, and many others in Gettysburg tended the wounded and buried the dead. 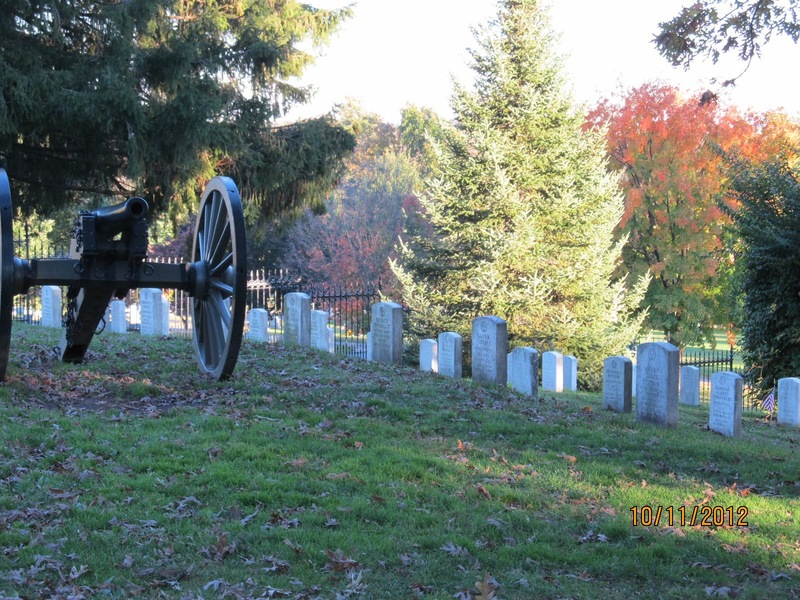 And on November 18, 1863, they attended the dedication of the new cemetery, consecrated to the men who died on their soil, where President Abraham Lincoln gave his now-famous Gettysburg Address. It is never weak to cry for those around us who are hurt. It is never weak to quake at the sight of bloodshed and injustice. But, like Tillie, women young and old have the strength to do things they never thought possible when the needs arise. One of my favorite quotes is also from Eleanor Roosevelt: “You must do the things you think you cannot do.” Tillie did things she never dreamed she could. It was an honor to learn and write about her. I hope young women will feel connected to her and will be emboldened by her example. 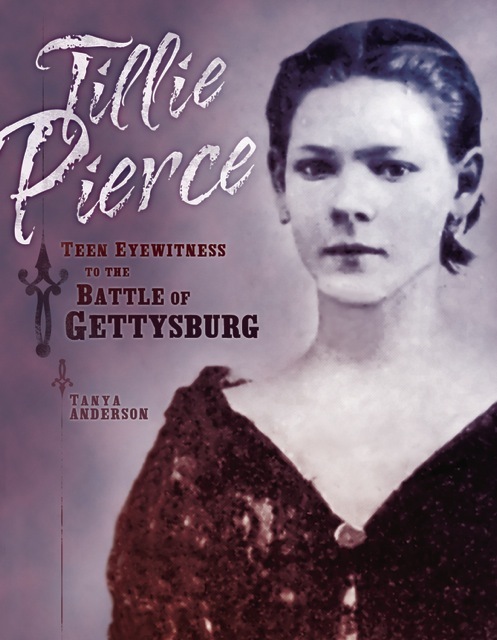 Tanya's book, Tillie Pierce: Teen Eyewitness at the Battle of Gettysburg (Lerner Publishing Group) will be published on April 1, 2013, and has already been named a Junior Library Guild selection. Tanya Anderson is an award-winning editor of books for young readers. 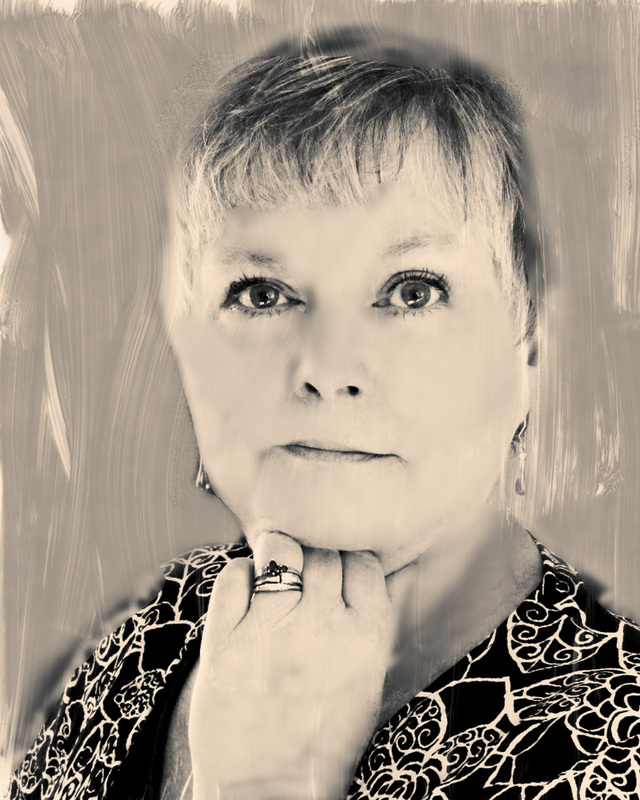 Her particular passion is to create engaging nonfiction books for reluctant readers, those who are capable readers but who have become uninterested in reading. Anderson discovered this need when she taught high school history and English. She continues in her role as a teacher and guide through the books she edits and writes. Anderson graduated from Wittenberg University in Springfield, Ohio, after a dozen years in the education field, she followed her dream of joining the children's book publishing world. 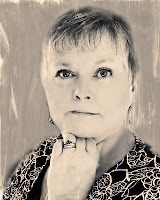 She has worked for more than twenty years in various editorial functions for Pages Publishing Group/Willowisp Press, Guideposts for Teens, SRA/McGraw-Hill, Darby Creek Publishing, and now has her own book packaging company, School Street Media. Besides working with some of the most wonderful authors and illustrators in the business, Anderson has also had more than thirty books published in the children's and educational book markets. I look forward to reading this, Tanya. Thanks so much for participating! I was happy to share Tillie with you all! She's a great example of grace under pressure! Just in this little bit that you've shared it is such a vivid, fascinating story. Like Lisa, I look forward to reading more about Tillie Pierce. I hope you love learning about Tillie as much as I did! I love that quote from Eleanor Roosevelt! I'm eager to read your book! I visited Gettysburg several years ago and it's a fascinating trip--one that everyone should take. We had a private tour of the battlefield, which I highly recommend. And there's a fabulous relatively new museum there too--our tax dollars at work. Thanks for sharing Tillie's extraordinary story. I never get tired of visiting Gettysburg! There is something special about the town and the people there. You'll recognize some of the places when you see the photos in the book. 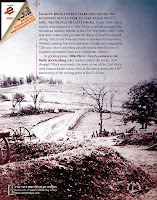 I'm also doing a Gettysburg Journal blog at www.tilliepiercebook.com! It is so good for our young readers to know more about the women & girls of this famous battle. I can tell from the writing that this book is a fast-paced read. Eleanor is one of my heroes! I hope you'll enjoy the book. It was a delight to research and write about Tillie. What Made Them Who They Became?